A comprehensive blog reviewing children's books with an emphasis on fun and nostalgia. Today I am absolutely delighted to be hosting Sam Usher for the Red House Children’s Book Award Blog Tour. I love ‘Can You See Sassoon’ – I remember ordering it for all my stores back in June. 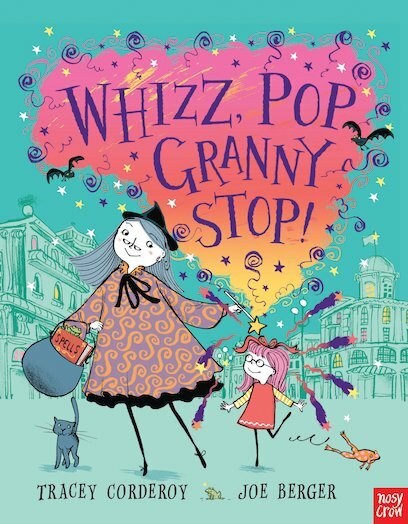 It’s a fun, colourful book and above all brings reading to life. Of course, we all know I love picture books…fundamentally, they make up what this blog is all about. I was drawn to this book when I first saw it, just by looking at the cover. It was different, it wasn’t shy about being different and exploring ways of getting children to read. This is what really appeals to me…the fact that the book challenges the reader in an interactive way by asking them to find Sassoon and of course, the illiteration is such fun. Today, the lovely Sam will be telling us all about his drawing skills, how he came about following his dream and the important things in life. Welcome to 5 Minutes’ Peace, Sam! My name is Sam Usher. I make picturebooks. I studied illustration at art school in Bristol, where I first came up with the character Sassoon. The book Can You See Sassoon? emerged from a couple of sketchbook ideas that I talked through with my art director. I spent my childhood drawing – I have spent so much time doing it I’m literally incapable of anything else. At primary school I would set myself projects, such as inventing a new toy pirate ship, or designing a range of trainers, then send off my designs expecting them to be put into production — they never were! Sometimes I take a step back and think “You weirdo, you spend all of your time mushing about with ink on paper” but then I realise humans have done that for thousands of years – people who don’t draw are the weird ones. The good thing about drawing is that it’s impossible to go wrong. You can learn to be more proficient at giving an illusion of reality, which is useful if you need to communicate something specific – e.g. designing a bridge – but really you can do whatever you like. All of my ideas come from drawing. I’ll fill a sketchbook with drawings of faces and one or two will stick out. Something about some drawings makes them leap off the page. Most are just scribbles, but some are real people — they don’t just look like people, they are real people who exist in the page. You begin to wonder who they are, what they’re doing, why they look happy or sad, and a story can come from that. I lied about being incapable of everything but drawing — I’m also OK at playing the piano. I live in North West London with an old man called Mr Mattingly. I cook his dinner three times a week and take him on trips to art galleries. In return he lets me live and do my drawings in his house. It’s like being in a Charles Dickens novel. My work is drawn in pen and ink — there is a long history in the UK of pen and ink illustration, from political cartoons in the 18th century, watercolour artists in the 19th, and people like Ronald Searle, Gerald Scarfe and Quentin Blake in the 20th and 21st. I am influenced by them, and French cartoonist Sempé. Drawing with a pen is a bit like writing a drawing. The black pen line is the words and the watercolour the tone of voice. A fantastic insight in to a fresh new illustrators world. And it’s at this point that I’m absolutely thrilled to announce… Can You See Sassoon? has been shortlisted in the Younger Children category of the Red House Children’s Book Award 2013. The Red House Children’s Book Award is the only national children’s book award voted for entirely by children. It is owned and co-ordinated by the Federation of Children’s Book Groups, and sponsored by Red House. Sassoon likes to hide…that’s why you can’t always see him, but can you find him? Look inside! 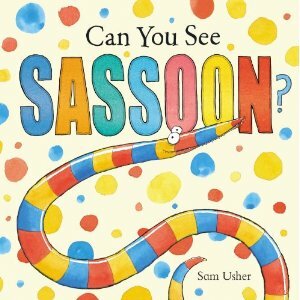 Meet Sassoon the snake as he plays hide-and-seek with his friends. Filled with fun and silly things to spot, this colourful book from exciting new talent, Sam Usher, is guaranteed to delight! And please do take the time to visit Sam’s website…you may even spot Sassoon! "He has purple prickles all over his back!"